eDM fans, you know you love them and if you don’t ,turn those speakers up and start listening! Meet the duo behind Rave Republic, Mathias Schell and Stas Madorski, the boys can turn any party around. Their energy gets you moving and grooving and now it’s time for you to show some love and vote for them to be make it into the DJ MAG TOP 100 DJS! We had the chance to sit down with them before they hit the main stage at ULTRA Music Festival in June. Read below to get to know a little bit more about these boys and make sure you follow them on Facebook and Instagram to find out where you can catch them live next! UJ: How did the two of you meet? 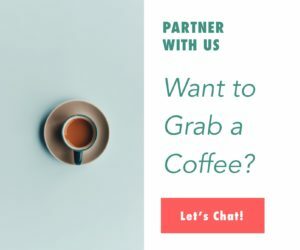 Tell us your love story and about how you came together. M: We met 6-7 years ago in Singapore. We were both Djing solo at different venues around Singapore. One Wednesday night I was playing at a club called Mink and Stas had just gone through a bad break-up so happened to be there that night. Stas wanted to be the centre of attention (as usual), so decided to play a quick 15-minute back to back set with me. The ‘quick set’ ended up lasting over 2 hours and the club even extended their opening hours; everyone was having so much fun! The rest is history. S: I hated DJing with others, as everyone has their own unique style and set programming. The chemistry we had on stage was unlike anything I could have imagined; I really was against becoming a DJ duo initially. M: When I was 13-14 years old I remember watching loads of Youtube videos of DJ performances. Shortly after that my cousin, who was a DJ back then, showed me the basics, and I was hooked! I then transitioned from playing the Piano to playing Electronic Music. S: I only got into clubbing when I moved to Singapore from Australia. I befriended some acts living here and had a big love and respect for what they do. One night at Butter Factory, there was a DJ from the Philippines playing an indie rock set, which happened to be the genre I listened to at the time. I had such an incredible time that after that night, I concluded that I want to be a DJ. UJ: What are your favourite / least favourite things about eachtoher? M: I don’t think I can pin-point a single ‘favourite’ thing about Stas as we just have so much in common! We get on really well together as we have the same interests in pretty much everything (Music, food, travel destinations etc). S: Where to begin…so many things I don’t like (sarcasm). Like Mat said, we get along incredibly well and have a very similar outlook on life. I’m really struggling to think of something I dislike; we don’t even fight. I’m jealous that he can fall asleep so easily on planes, though. UJ: If there is a track that defines you, what would it be OR Favourite track of all time? S: Brand New’s “Okay I Believe You, But My Tommy Gun Don’t”. Wow, that’s a mouthful. I had many distinct musical stages growing up: hip hop, metal, punk, ‘emo’, indie rock and now electronic music. These have influenced how I approach music. UJ: Most memorable experience of your career up to date? M: Playing the Main Stage at the first ever Ultra in Singapore will always be a very big moment for me. It was always a dream to play Ultra Music Festival, and that dream came true! S: 100%! I have been dreaming of an opportunity to DJ the main stage of a major festivals for so many years. I couldn’t believe it when we heard the news, a few years ago – huge thanks to the organisers for believing us and giving us the opportunity. Illumi Run Festival has also been an incredible event for us to play, as we are able to connect with our younger fans, who we don’t get to rave with in clubs. UJ: What role, if any, has being in Singapore / Southeast Asia played a role in your DJ career? RR: Singapore has been responsible for our career. We both learned to DJ in Singapore, and we owe the country everything! We’ve both lived here for around 10 years now! Beyond DJing, Singapore has shaped who we are as people. We absolutely love it here! Southeast Asia is so incredibly diverse, culturally and musically – we played 50 shows across different countries in our region last year. Thanks to our experience playing across the different countries, we’ve learned to be very adaptable and to play to all kinds of crowds. UJ: How have you seen the music seen evolve in this region in the last few years? RR: The dance music scene has exploded in this region. There are now big scale music festivals happening almost every month. An increasing number of international DJs are also heavily touring around Asia, exposing people to new genres of music. We’re definitely able to play more diverse sets and the crowd in Singapore is definitely more receptive to hearing new things, while it was almost fully commercial before. The one barrier we are still seeing is that talent from our region is not getting the recognition that they deserve, internationally. Music and acts from the USA and Europe dominate internationally and even in Asia while the reciprocity isn’t there. Our region has so much incredible talent and we hope that slowly we will see more success from acts and music styles from Asia. UJ: Why are you competing in the DJ Mag TOP 100? What do you guys hope to achieve? RR: After playing all over Asia, we hit a ceiling. Despite releasing with Warner Music and playing major festivals in our region, it’s still difficult to find bookings and gain visibility overseas. While we will have our first Europe and USA shows this year, it has been a struggle and we’d love to take our sound to more areas of the world. Our big motivation is to put Singapore and Asia on the dance music map, globally. After ranking in the Top 100, we are hoping to create a platform and help other stand-out acts gain recognition overseas: whether they are DJs or producers. A dream outcome would be to have 20% of the rankings come from our region. 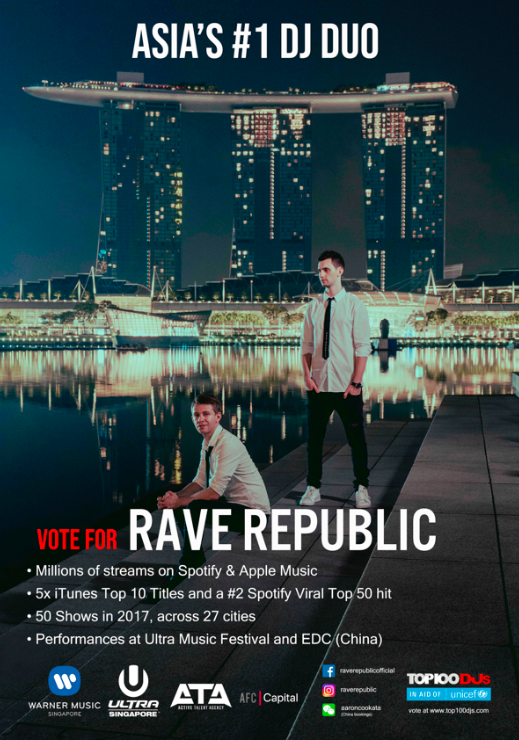 Rave Republic is Asia’s #1 DJ duo having performed at over 50 shows in 2017 with sell-out events at major festivals and top clubs. The are one of the only electronic artists signedd to Warner Music Asia. They’ve had multiple #1 releases on iTunes and a handful of radio hits. They’ve performed alongside many of the DJ Mag Top 100 acts including Afrojack, DJ Snake, Skrillex, Marshmello, Nicky Romero, Alesso and many more.